I have served as Board member of Sage Institute since 2008, along with award-winning writers and teachers Sean Murphy and Mirabai Starr, among others. “Sage Institute is dedicated to education in the areas of creative expression, environment, and human consciousness. Our areas of concern range from creative arts and literature to contemplative, meditative, and mindfulness practices, as well as the sciences, social sciences, and environmental/ecological preservation. We believe that creative study and investigation in the realm of human consciousness, as well as creative thinking, problem-solving, and action, provide the best hope for dealing with the many crises currently besetting human society and the earth. We are committed to a multicultural approach incorporating indigenous and traditional wisdom traditions as well as research in science, environment, and human consciousness. Gary is a dear friend, revolutionary spiritual teacher and life-changing coach, with whom I have worked for over a year, whose presence, perspective and teachings have had a tremendous impact not only on me but also on clients from all over the world for decades. Working with and learning from Gary has been nothing less than life-altering and life-affirming for me, in more ways than I can adequately articulate. Steve believes that life, through consciousness, precipitates out of the quantum vacuum. The success of social evolution is based on leadership which employs honed intuitive and listening talents, knowledge of continuously adding value, and banks on sacred economics and conscious capitalism. The common thread of all new ideas are to sustainably increase personal and community value. Established ideas are re-evaluated for personal and community vision and evolution. High level creative conversations result in positive change affecting hundreds, thousands and millions of people. Judy, like her photography, is amazing: Bared, honest, compelling and utterly unflinching. Judy is a renowned, veteran photojournalist, with an astonishing array of assignments, awards and honors. She was part of a team of journalists at the Dallas Morning News that received the 1994 Pulitzer Prize for International Reporting for their series on violent human rights abuses against women worldwide. Her other honors include an Award of Excellence from the Robert F. Kennedy Foundation, The Harry Chapin World Hunger Award, The Barbara Jordan Award and the APME Photojournalism Award, among others. Judy took a few of the black-and-white shots on my old website during a trip we took to NYC in 2003. The cover photo of the documentary short film about my work, One Woman’s Voice, taken in front of the New York Public Library, was one of those shots. Judy remains not only a dear friend but an inspiration to me, as she was when we first met in Taos, NM over 15 years ago. The Helene Wurlitzer Foundation of Taos, New Mexico, established in 1954, is one of the oldest artist residence programs in the United States with the mission to “Support the artist and the creative process”. Located on 15 acres in the heart of Taos, a four-hundred-year-old multicultural community renowned for its popularity with artists, the Foundation offers three months of rent-free and utility-pain housing that serves as a haven for visual artists, literary artists and music composers of national and international origin. My time as a Fellow at The Wurlitzer Foundation in 2008 was life-altering. The Equine Spirit Sanctuary is a non-profit, volunteer-based healing center that believes in responsible horse care and ownership. ESS is dedicated to the safety and welfare of all equines and, through a program combining rescue, rehabilitation, relocation or permanent retirement with education, serves to establish a healthy connection between equines and humans. Ruth Bourgeois, the ESS founder and director, is a continual inspiration to me for her dedication and how she handles both horses and humans. 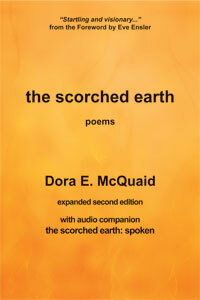 Bob is responsible for the first production of the 2002 compact disc, the scorched earth: spoken, which is the companion to my first book, the scorched earth. Although that earlier version of the CD is no longer available, I’m grateful to Bob for all of the ways in which he made it possible years ago.